Camping with friends is always fun and memorable! Who doesn't enjoy sitting around a campfire amidst tall trees on a chilly evening with close friends eating grilled chicken while roasting corn on the campfire. Eating tasty watermelon and juicy cherries while watching the lovely sunset. Savoring a drink and singing old melodies while marveling at the magical Milky Way. We love and enjoy all of it, especially the experience of living outdoors close to the Nature, making us eagerly look forward to every camping trip. So, when our friends suggested camping for Memorial Day long weekend, we had to go. We were lucky to get an almost last-minute reservation for a group site at Rainbow campground in Big Lake, Arizona. We were a group of 15 people and our group site # 80 was just perfect. Spacious, private and beautifully appointed among tall trees, complete with a wooden bench, fire pit and a water spigot, and not too far from the restrooms, we could not have asked for a better campsite. However, an elevation of 9,200 ft meant we were shivering in our tents at night even though Memorial Day officially screams summer in Arizona. It took several layers of blankets before we could comfortably sleep but that is part of the camping fun, ain't it? We spent the first day cooking and eating (on a repeat mode); playing Frisbee and Dodge ball during breaks. We spent the cool evening by the serene lake and the cold night by the warm campfire. After dinner and drinks, singing old songs and sharing ghost stories, at around midnight while it was almost freezing cold and eerily silent, we decided it was time to go - go hunt for an open space to wonder at the twinkling stars and capture the Milky Way in our cameras. Our camping trip is getting interesting, isn't it? But the best is yet to come. 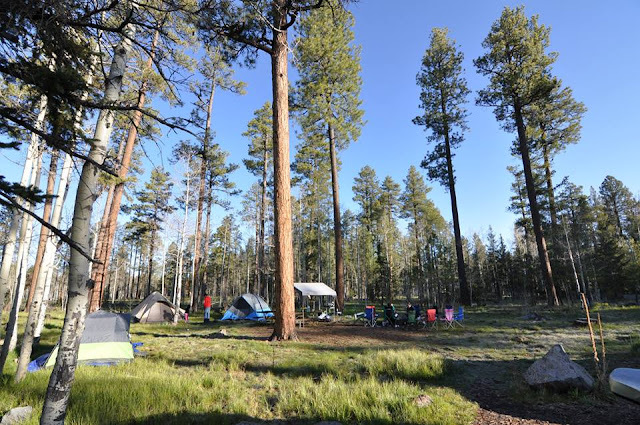 We camped at a few places in Arizona before (once in Page and twice in Payson), but I think Rainbow Campground is by far the best in Arizona both in terms of location and amenities. Its location in Big Lake Recreation Area meant you have access to boating, hiking, fishing, and kayaking. We went kayaking while some of our friends enjoyed boating. Mid-day kayaking in a big blue lake surrounded by White Mountains and tall green pines is an experience I thoroughly enjoyed and highly recommend. Back at the campground, a hot shower cost us $6 per person, but it was worth it. The shower rooms were big, bright (with a skylight) and clean and the water was hot and nice. After a refreshing shower and eating fresh watermelons, we were a happy bunch! If we were to go camping to this place again, we would do it all over again with a few extra blankets this time :) Have fun camping this summer, y'all. See you soon!